When you purchase a Vanway kitchen, you’re investing in kitchen cabinets and countertops that will last for decades. To keep your natural wood cabinets looking their best, you’ll need to provide a certain degree of care and maintenance. This will ensure your cabinetry ages well despite spills and splatters. The good news? It’s not difficult to keep your cabinets looking clean and polished. Follow these three tips to care for your Vanway cabinets the right way. Your kitchen cabinets are made of wood, which is a natural product. Wood is damaged by liquid – and therefore, your cabinets will be damaged by moisture, too. Moisture can warp the wood, permanently damage the finish, and leave ugly stains and watermarks. Whether you’ve splashed water while washing the dishes or had an accident with a pot of spaghetti sauce, you need to remove the excess liquid right away. Never leave moisture to air dry. Wipe up any splashes with a soft clean towel. The finish on your kitchen cabinets can be damaged by any cleaning product stronger than dish soap. To keep your cabinets looking as good as new, avoid wiping down your cabinets with cleaning agents or cleaning wipes. To clean up spills and splatters, start by wiping the stain immediately with water. By taking care of the stain right away, you’ll avoid the need for scrubbing and chemicals later on. Your kitchen cabinets might be made from hardwood, but that doesn’t mean they’re invincible. The finish on your kitchen cabinets can and will be damaged by any kind of scrubbing. The only thing you should use to clean your cabinets is a soft cloth – avoid using the scrubby side of a kitchen sponge, scouring pads, or steel wool. These tools may be great for cleaning dishes, but they’ll irreparably damage your cabinetry finish. For more than three decades, we’ve produced top quality cabinets. We’ve also seen many damaged finishes and cabinet doors, with the ones directly under the sink being the most common. You can avoid cracks in your finish and peeling paint by following the steps listed above. In February 2017 we decided to update our kitchen as it had not been renovated since 1996. After checking out a few places we chose Vanway to do the reno as they had what we wanted, the people we dealt with were very helpful & friendly & the price was very comparable to other outlets. 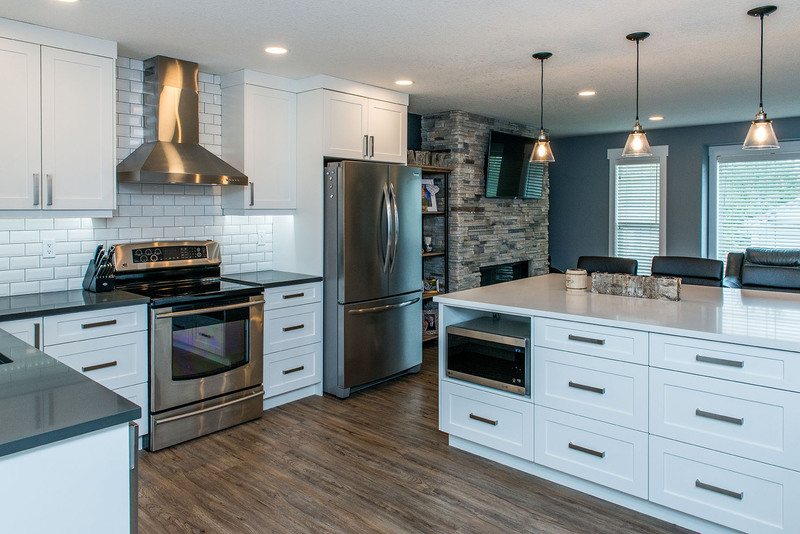 There was a section of wall that needed to be built to support the new quartz counter in one area & the workmanship & matching the color to the existing color was fantastic….you couldn’t tell the difference in color at all! The final result was amazing & was completed in a very short & timely manner. Not only were we very please with the individuals we dealt with because of their knowledge & friendliness but the overall completion of the wall & new counters to our kitchen was amazing & I have never been happier!